And don’t miss the time-saving Amazon find after the recipe! 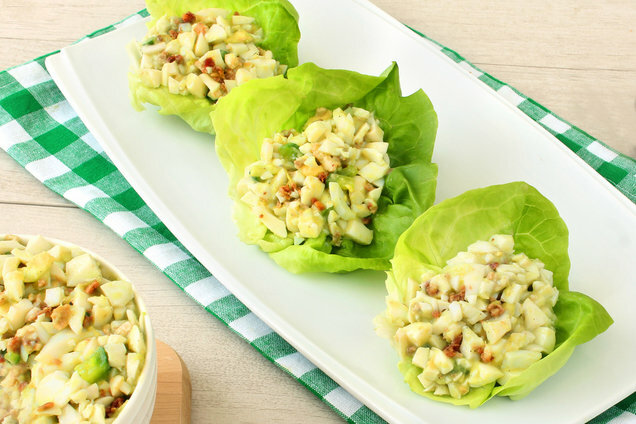 There are SOOOO many great ways to enjoy this scoopable salad: in lettuce cups, on a 100-calorie flat sandwich bun, over a bed of leafy greens... or straight outta the bowl! In a medium bowl, combine avocado, yogurt, and seasonings. Mix until smooth and uniform. Gently stir in chopped egg whites, cucumber, and bacon. HG TIP! If not eating immediately, place in a sealable container, and store in the fridge or with an ice pack in your lunch box. Hi, guys! It’s me, Lisa. 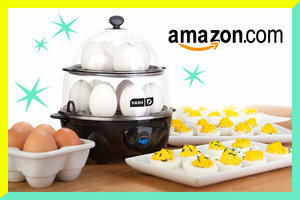 So we’ve featured the Dash Rapid Egg Cooker before (people are OBSESSED with it -- it has over 6,000 reviews on Amazon! ), but I just about fell out of my chair when I saw there’s now a DELUXE version of the cool countertop gadget that can quickly cook a DOZEN eggs at once! Soooo much easier than waiting for a pot of water to boil to make hard-cooked eggs for recipes like today’s. It can also make omelets, poached eggs, and scrambles, and it can even STEAM foods like veggies and seafood. Last time I checked, it was on sale for $29.99... That’s only a bit more than the standard 6-capacity cooker. Totally worth ordering! Hungry for More High-Protein Recipes with 5 Ingredients or Less? It's National Peanut Butter Cookie Day, June 12th. These Monstrously Delicious Monster Softies are packed with peanut-butter goodness, wholesome oats, and M&M’s! Keep your buddies well fed... Click "Send to a Friend" to share this recipe!